Service dogs that help people with disabilities need to be unflappable. They need to be comfortable in different environments, and immune to distractions. Distractions like cats. Our story focuses on the remedy for that, in the form of one cat named D-O-G. Anyone who has ever loved a dog knows that pesky cats can try the best doggy like nothing else. First, they bat at your leash. Then they play with your tail. And then, finally, they try to steal your bed. They go streaking through the house, looking all fluffy and sly. A good dog knows that cat is up to something. A good dog will want to bark and warn people! Or at least to run off to investigate. But a service dog has to be above all that. Image by Support Dogs, Inc. Via Facebook. And D-O-G isn’t even a year old yet. D-O-G started out life as a barn kitten. Which means he was used to hanging around much larger animals, and fending for himself. Nadine Wenig, the director of canine services at Support Dogs, Inc., met D-O-G at a bed and breakfast. She fell in love with the little tough guy, and the B&B owners ended up giving her the kitten. She brought D-O-G back to Support Dogs, Inc, and a trainer was born. 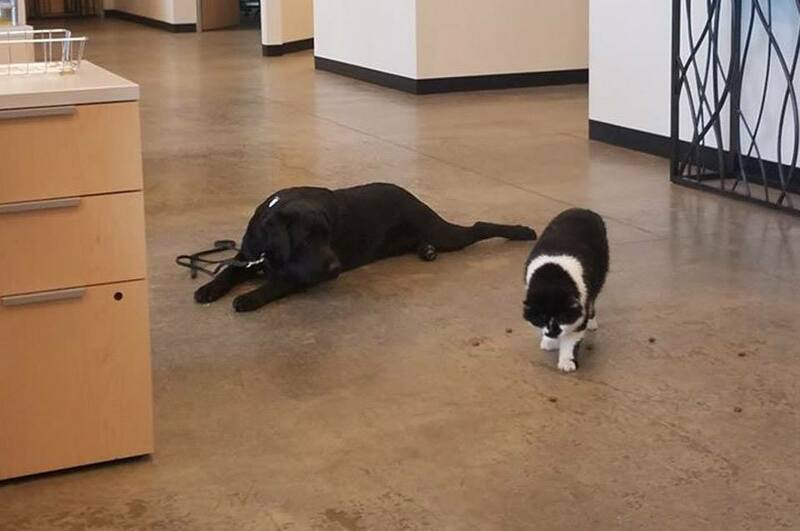 But to 23service dogs in training, D-O-G is the boss, and he’s teaching them to put a leash on their cat chasing instincts. 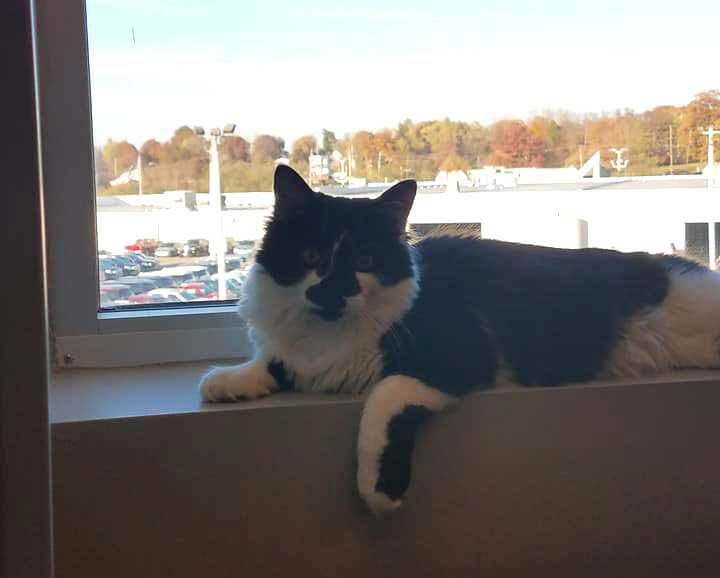 Of course, when D-O-G is not working, he spends his time lounging in his multi-level cat condo and reveling in affection from Support Dogs, Inc. staff. Would You Like to Work with Service Dogs? Do you think you have what it takes to become a service dog trainer? You might be right. But be prepared for a lot of work. According to service dog resource site AnythingsPawsible, the road to becoming a service dog trainer is long. First, you have to have extensive experience working with dogs. Many service dog trainers are experienced dog trainers before they undertake service dog training. Then there is a period of academic instruction, such as an associate’s degree in assistance dog science. Finally, there’s a period of apprenticeship, so you can get hands-on learning. If this sounds like too much, but you still want to be involved, you might consider volunteering with an assistance dog organization. You might also consider volunteering for a search and rescue dog organization like the Search Dog Foundation. The Search Dog Foundation rescues dogs from shelters and trains them to be search and rescue dogs. They have numerous volunteer positions available, both working with dogs, and fulfilling other functions. Feral cats and barn cats like D-O-G are often too wild to be good pets. But it doesn’t mean they don’t have valuable skills. Many cities have started Working Cats programs. Working cats programs trap, neuter, and vaccinate feral cats. Then they “hire them out” to businesses for pest control purposes. These programs have been a runaway success in places like downtown Los Angeles. Businesses get an efficient, poison free pest control solution, and feral cats get food and shelter, rather than the sad end that befalls many of their kind. If you want to help cats like D-O-G find a job and a home, check out the working cats program in your area. Featured Image is by Support Dogs, Inc., via Facebook.